Investors are overreacting to Nike's slowing sales growth and creating a good buying opportunity in the process. 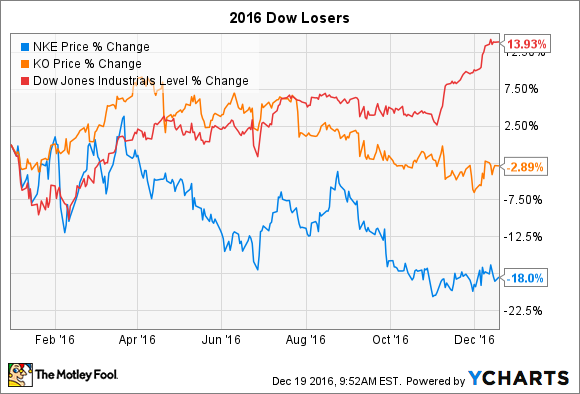 With just a few trading days left in the year, several stocks are jostling for first place among the 30 Dow components. UnitedHealth, Caterpillar, Chevron, and Goldman Sachs are each up by more than 30% as we close out a 2016 that's seen the broader index rise by double digits. Barring a huge late-year rally, though, it's clear that the Dow's worst stock will be Nike (NYSE:NKE), which is down 18%, while only one other losing member of the index (Coca-Cola) is just barely in the red. Sure, Nike suffered performance stumbles that compounded a general sales-growth slowdown this year. Yet the business has a bright long-term outlook that could make the stock a great buy for patient investors. Sales growth dipped to a 10% pace in the quarter that ended in August, down from 12% over the prior year. Nike's strongest geographies were China and Western Europe while the U.S. market, its biggest by far, struggled. Sales rose by just 6% there, compared to Under Armour's (NYSE:UAA) (NYSE:UA) 16% spike. A closer look reveals that Nike stacks up well against Under Armour, though. The sports apparel upstart's growth slowdown is more pronounced, with its latest 16% U.S. expansion pace following a 22% jump in the prior quarter and a 27% gain to kick off the fiscal year. Nike's 2-percentage-point decline is tamer by comparison. Both companies are sacrificing profits as they fight for growth in the U.S segment. 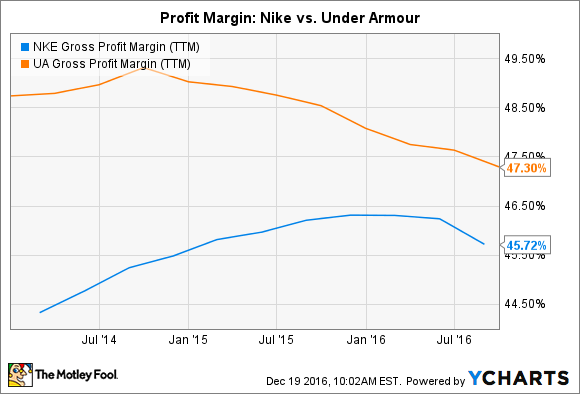 Price cuts have driven gross profit margins down for Nike and Under Armour, but the market leader is faring slightly better. Operating earnings in the U.S. fell 4% last quarter, compared to Under Armour's 8% drop so far in 2016. The near-term outlook for Nike's profitability isn't bright, as executives expect gross profit margin to decline for the second straight fiscal year. That drop is the result of unusual factors that don't imply an eroding of pricing power, though. Last quarter, for example, Nike enjoyed higher average selling prices and lower input costs. Normally those trends would produce strong profit gains, but the improvements were swamped by foreign exchange charges and increased spending on the e-commerce sales channel. That's how gross profit margin fell by 2 full percentage points in the fiscal first quarter. Add in a huge increase in marketing expenses tied to the Rio Olympics and the European Football Championship, and it's clear why operating earnings fell by double digits. While leaving the official outlook in place, CEO Mark Parker and his executive team have hinted at a potential rebound ahead for the coming year. Yes, the same factors that held back gross profitability will be present, but their impact will lesson over time. Nike sees gross profit margin improving to a flat pace in its fiscal third and fourth quarters from a slight decline over the prior six months. In my view, investors haven't given the management team enough slack to allow those longer-term trends to show up in the results. The stock sold off after last quarter's solid numbers, after all. This slump came despite Parker's claim that Nike's "underlying fundamental drivers of gross margin expansion remains strong," even if they are "being offset in the short term by temporary or discrete factors" including foreign exchange rates and e-commerce growth. Nike's near-20% drop heading into its final quarterly report of the year means investors are betting its sales growth slowdown will continue even as profitability shrinks further. But the strong pricing trends imply that Nike could soon start posting the type of operating improvements that would drive market-beating shareholder returns, especially given that shares are valued at 22 times next year's projected earnings -- down from a P/E of 29 at the start of 2016.